King of the jungle or misguided cat? Jazzel’s oozing effervescence and abrasively arrogant self-confidence is almost palpable. You can almost practically slice through it like a hot knife through butter. He plays the role of the master with admirable ease as he makes the phenomenal claim that he started it all. Is this the confidence of a liberator, the true king of the musical jungle? Or is it just the bubbling arrogance of another ‘misguided cat’? Time will visit us all with an answer one day. And the listeners too! Alfred Saidi aka Jazzel hails from Bindura in Zimbabwe and was born some thirty-something years ago. He’s a little finicky with his age. Perhaps a deliberate ploy to imbue him with some mystery and some appeal! Whatever the case maybe, suffice it to say that Jazzel is a rapper, a poet and a songwriter – three-in-one! Jazzel’s maternal uncle, Peter Ngoreta, is a musician from the late 1970s. He recorded a single entitled ’Ka-2-dollars Pasvondo’, perhaps a sarcastic reference to the slave wage of $2 a week that many earned in that era. Ngoreta’s offspring are musicians of note in their own right. They have, however, chosen to go into the Gospel Music arena and their band called Reverb has four albums to its name. As does always seem to happen in the music community, two of the Ngoreta siblings have moved to South Africa where they have become members of Heal Praise. This outfit is getting quite a bit of airplay on SABC. Saidi is a former pupil at Bindura’s Chipindura Primary School and Chipadze High School where he first began to cut his teeth in music all those years ago. In those days of covers Jazzel was fondly listening to groups like A Tribe Called Quest, Rakim, Pete Rock & C L Smooth and Diggable Planets among others. He was also inspired by Zimbabwean groups like Peace of Ebony, Blackfoot Tribe, Cataclysm, Ghetto Project and Mau Mau. Like most young people of his time Jazzel’s favourite radio station was Radio 3. Jazzel was fascinated by such DJs as Kimble Rodgers, George Munetsi, Otis Frazer and Hosea ‘The Hitman’ Singende. It was on one of The Hitman’s Da Raptivity Jams that the young Alfred Saidi won a rap contest in 1995. Not surprisingly, Saidi went to the studio in 2002 where his first recording, an EP called ‘Hanzi Tshii’ saw the light. In fact he was to have done a complete album with producer Jairos Hambahamba, former keyboardist with Oliver Mtukudzi. After they had done a few tracks at Country Boy Records something went amiss. The hard drive of his recordings crashed! And yes, you guessed it. There was no back-up. Feeling disillusioned Saidi tried other things. He left the country for a short while and on his return he took up a job with New ZIANA, a Zimbabwean News Agency. He was a freelance entertainment correspondent. Happily for his fans, Jazzel’s sojourn in the newsroom was only a temporary one. Rap music in Zimbabwe would have been much the poorer without him. His style is reminiscent of Arrested Development, Ice Cube and even Naughty by Nature. He has remained true to some of the fundamentals of Rap music. I was there in the beginning of this Hip Hop movement in Zim. The album had tracks from what would originally have been his first album. It was also a combination of songs done at different times. These include Blah, blah, blah! You need to hear this song for yourself. It traverses the avenues of political correctness with its reference to ‘mabhunu ari down South’. Jazzel says he’s just being a little creative with his use of language. The sound of guns in the background does not help matters. If anything it tends to argue that the song cannot by any stretch of the imagination be an innocuous little piece. Well, it’s a new democratic society and he has his rights. Jazzel’s efforts at recognition are, seen in another light, quite commendable, given that he is from a small town. He echoes the sentiments of many in Zim about the disadvantage of not being in Harare if you are into anything artistic. 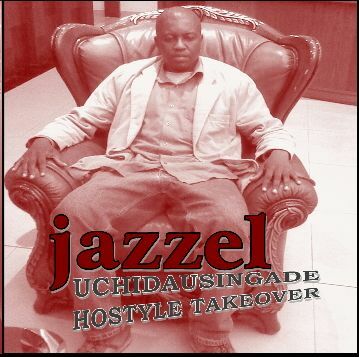 His second album is a sophomore 14 track album entitled ‘UchidaUsingade/HostyleTakeover’ produced by DJ Aliville again for GhettoCraft Entertainment. “The theme is inspired by the desire to excel in the face of adversity.” Jazzel says. Everything is about Harare. More often than not, if you are from out of Harare you probably have to relocate there. That is generally the only way to get noticed. The radio stations and the sole TV station are in Harare. Music, especially, is not for the faint-hearted. You have to be a hustler – a hard one! Jazzel is striving to fuse traditional mbira rhythms with rap and has definitely succeeded on the song Kwavakuenda done with Agwabada and Chamale. The track is creativity at its best. His songs are published by Subliminal Works of Art (SWART) a record label Jazzel co-owns with his younger brother, Cube D Swagger an upcoming producer and MC based in South Africa. Jazzel is busy of late and has featured on two Zim Hip Hop projects compiled by Promethus, the Zim Hip Hop Report host. He was recently hosted by Prometheus on ZTV and is getting ready to ‘drop a single’ and do an album before the year is out.